Written in a Stornoway cemetery, at the memorial to my great uncle, lost at sea. and did not let go. "there shall be no more sea!" their men would walk to Judgement. and ports of other lands. the grey wave and the white wave..."
I read their simple graves. Arrival in Stornoway, the only town of any note in the Western Isles, is a shock after the wide open spaces and relatively quiet roads of the Uists and Harris. Here are trees, pavements, streetlights, suburbs, even a rush hour. After a week of wild or semi-wild camping, the cyclist feels particularly out of place in the streets of Stornoway. The first time I visited Stornoway, I didn't like it much and couldn't wait to leave. This time round was better, and we strolled around the harbour, with the lush, rhodedendron-choked Lews Castle estate and handsome white-painted harbourside houses opposite, looking in vain for seals that we were sure would be bobbing about just offshore. We also visited family graves in a cemetery just outside Stornoway. It is impossible in Lewis not to be struck by the number of headstones in graveyards commemorating people who drowned at sea. The best beaches I have ever seen are those on South Harris. I reckon they are the best in the whole UK. However, my sister has been to Bernera and says there is an even better beach there, better than the ones she saw on Fiji - a claim independently verified by a similarly well travelled friend, Duncan, who also says that the beach on Bernera is the best he has ever seen. But, I haven't been to Bernera yet, so those of South Harris will have to do. Arriving in Harris at Leverburgh from the Uists, the machair suddenly gives way to rocks - impudently bursting through the thin earth at every point, loose boulders lying on top. It has been called a moonscape by some. Inhabitants on other islands joke that Harris sheep have specially chiselled noses to seek out the few blades of grass. What is indisputible is that there is insufficient soil to bury the dead on the east of Harris, and coffins had to be carried from the bays settlements to the more fertile west coast, where the people had lived before they were cleared off the land in the 19th century to make way for sheep. On to the beaches! The cyclist has the option from Leverburgh of travelling either coast to Tarbet. Thanks to intelligence that morning from a south-bound cyclist in a cafe in Berneray, we knew there was the option of a reasonably flat route past superlative beaches on the west coast, or a torturous twist up and down and round innumerable rocky bays on the east coast. It was not a difficult decision to make. The first beach is Traigh Mor, which merges with Traigh Scarista: Miles of pale sand, wind-whipped into a sandstorm out on the beach itself, surf crashing in, the low, rocky hills of Harris as a backdrop. Then Borve; then Traigh Iar; And Nisabost, Seilibost, Luskentyre, Rosamol. Not bad for what is usually described as a bleak, windswept island. We nearly cycled past Dun an Sticir on North Uist, but I am glad we stopped. It is one of the best crannogs I've seen. It's a combination between a dun, crannog, and broch, built originally some time in the iron age and added to and used until medieaval times. After crossing one causeway to an island where local council meetings used to be held, another, sunken causeway can be crossed to the broch, filled with nettles. Remove your shoes to cross the causeway but mind your feet on the nettles! Sheep wade across the shallow loch from one shore to the next, with swans swimming nearby. There are a couple of hills near the Dun. 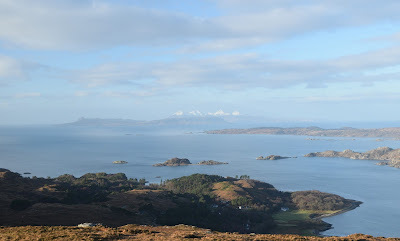 I marginally prefer the view from Beinn Mhor, but Crogary Mor has a fine view also. Benbecula is a small island between islands. The North Ford connects it to North Uist, and South Ford connects to South Uist. Now that modern causeways cross the fords, travellers no longer have to wait for low tide or take a boat from Benbecula. At first sight, the island is a place between more interesting ones. This would be unfair. Benbecula has silver sands as fine as any in the Uists, as well as the Uists largest village, Balivanich. The fords also look like great places to watch for wildlife - but we didn't hang around to find out. We were just passing through. Travelling through South Uist, the most striking monument you see is Our Lady of the Isles. This is a 30ft granite statue of Madonna and Child, commissioned by the Catholic Church. Rumour has it, it faces north to wind up visitors coming across the water from the Protestant islands. I have no idea if that is true or not.